Minding Spot: An Appetite for Violets by Martine Bailey Giveaway! 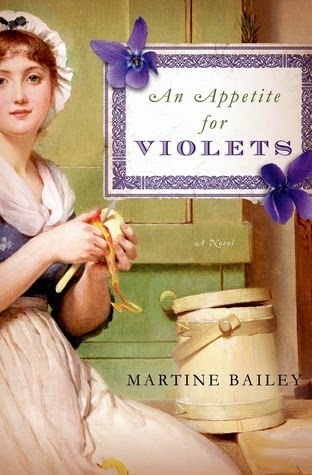 An Appetite for Violets by Martine Bailey Giveaway! That’s how it is for us servants. No one pays you much heed; mostly you’re invisible as furniture. Yet you overhear a conversation here, and add a little gossip there. A writing desk lies open and you cannot help but read a paper. Then you find something, something you should not have found. Irrepressible Biddy Leigh, under-cook at the forbidding Mawton Hall, can’t wait to settle down with her sweetheart and set up her own tavern. But when her elderly master marries the young, enigmatic Lady Carinna, Biddy is unwittingly swept up into a world of scheming, secrets, and lies. Forced to accompany her new mistress to Italy, Biddy takes with her an old household book of recipes, The Cook’s Jewel, in which she records her observations. When she finds herself embroiled in a murderous conspiracy, Biddy realises that the secrets she holds could be the key to her survival – or her downfall . . .
AN APPETITE FOR VIOLETS is an utterly compelling story of food, obsession and mystery, introducing a brilliant new voice in historical fiction. One lucky reader will win their own copy of An Appetite for Violets! I think Biddy's role as servant will definitely play a key role in the story--looks great, thanks for the chance to win!